It is the rare doctoral student who is the principal author of a book. Yet Emad Omrani—a doctoral student in materials science and engineering—not only accomplished this, he will soon be credited as an editor of a second book. 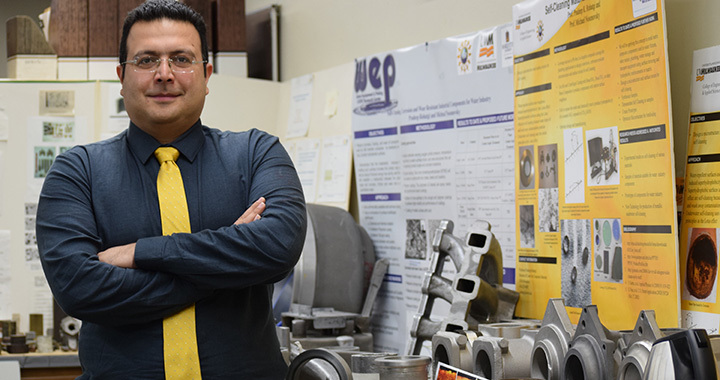 “Tribology and Applications of Self-Lubricating Materials”—written by Omrani and co-authored by Pradeep Rohatgi, UWM distinguished professor, and Pradeep L. Menezes—was published last month by CRC Press. The book provides insight into the complex mechanisms behind the development of self-lubricating materials and stems from Omrani’s research at UWM, where he worked under Rohatgi in the UWM Center for Composite Materials and Advanced Materials Manufacturing. Omrani has 14 research publications with more than 400 citations.